Turkey is naturally very low in fat, but best if you stick to the white meat and also avoid the skin. A good source of vitamins and folic acid, eating turkey aids the nerve function and assists growth, along with boosting the immune system. It is a great favourite in low fat diets and very versatile. Rich in calcium and protein and naturally low in salt, it is an all round beneficial addition to your food intake. A wonderful 'winter warmer' or even a brunch dish, and a way to get the children eating vegetables! Heat your oven to 160C/325F/Gas Mark 3. Finely chop the onion using your chopping board, and also the celery. Heat a little olive oil in a pan and fry the onion and celery on a low heat, stirring to stop any burning. You only want to lightly soften the onion and celery as they provide a good texture against the soft turkey mince. When softened, put the turkey mince into the same pan and mix well, adding the curry powder and the stuffing mix as well. Leave on a low heat, stirring well until the turkey is cooked through. Season with a little salt and pepper. Taste the mix, and if you want it a little spicier, add curry power or cumin to heat it up a bit. Leave to cool. On your board, take the tomatoes and cut off the stalk tops, about 2cm down. Leave to one side, do not throw away. With a sharp knife, remove the inside core and flesh, being careful not to cut through the side of the tomato. On a clean board, place some kitchen paper and turn the tomatoes upside down to drain out the seeds and excess moisture. Carve a little piece of the skin off the bottoms so that the tomatoes will stand up when being cooked. When drained, turn back over and lightly season the inside of the tomatoes. 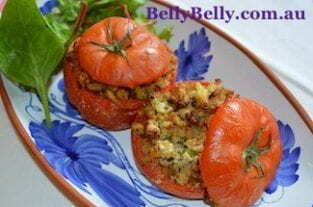 Fill the tomatoes with the turkey mix and place in a deep sided baking dish. Place in the oven and cook for 15 minutes. Take the tomatoes out and place the little tops back on. Place back in the oven and cook for a further 20 mins or until they are soft to the touch. You can really spice up the turkey stuffing mix if you want to serve this to the more discerning palate.